On Saturday the Twin Cities were buried under 17 inches of snow. It was the most snow we’ve had since the infamous Halloween blizzard of 1991 (which the old timers seem to use as a test to see how Minnesotan you are) and the fifth all-time biggest snowstorm for the Twin Cities metro. It was coming down at a rate of 1-2 inches per hour at times and paired with strong winds pretty much shut down the Twin Cities for the day. The airport closed, bus service was canceled, the Mall of America closed early, the post office stopped delivering mail, the Salvation Army bucket brigade even called it quits. The Department of Transportation urged emergency travel only. I shoveled three times, once on Saturday in the midst of the blizzard, again in the evening after it stopped, and then on Sunday to finish up. 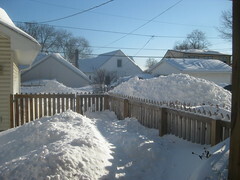 Snow is piled 2-3 feet in my yard, with a nice 6-foot pile in the back. Lexi “helped” the first time I shoveled and Milo came out the second time, though it took longer to get Milo dressed than it did to shovel. On Sunday morning the Metrodome roof collapsed under the weight of the snow, creating loads of jokes on Twitter, most to the effect that it’s the perfect metaphor for the Vikings’ season. On Sunday we ventured out to church and the roads were mostly cleared—except for any side streets in St. Paul. On Monday morning the temperature plunged to -8 and both Minneapolis and St. Paul canceled school (blaming it on uncleared streets and cold temperatures). We already had a fair amount of snow on the ground (we had maybe 15 inches already) and now it looks like it does in mid-February when we’re nearing the end of the snow season. Historically, the Twin Cities average 8.9 inches of snow in December. So much for that.